Livvy Weld opens her orange lunch box slowly but surely. She methodically removes a Tupperware of salad and another of dressing. Weld’s salads usually hold a variety of nutritious tidbits, and today her salad is a conglomeration of leafy spinach greens, avocado, and walnuts. According to Vegetarian Times, 3.2 percent of U.S. adults follow a vegetarian based diet, 0.5 percent of that population are vegan. Many of the vegetarians at ARHS first tried the diet due to animal rights or health benefits.Weld, for one, tried it for a week, liked it, and decided to stick with it. This was back in eighth grade. “I was on a trip with a friend and we didn’t like any of the hotel food with meat in it, so we decided to go vegetarian…I ended up really liking it,” she said. Katya Schwenk became vegetarian four years ago but her reasons for sticking with it have changed. “I originally became vegetarian for reasons like animal activism but now it’s more for environmental reasons” Schwenk said. Meals for Schwenk often include foods like eggs, avocado, tofu, and a lot of vegetables. Weld enjoys a variety foods like tempeh, nuts, and oreos. Some may feel that eating vegan requires eating more food, to make up for lost protein. Weld disagrees. She feels that eating vegetarian is not detrimental in any way to one’s protein intake. There are just as many vegan and vegetarian substitutes that provide protein. Some also believe that vegetarian or vegan diets are more expensive, due to the perception that vegetarians buy more organic produce or shop at Whole Foods. In some cases, this is true, due to their increased consciousness around how food is grown or where it comes from. Weld said that the increase in money spent on high-quality vegetarian food is balanced out by a decrease in cash spent on meat. “Eating healthy food is pricey in general, But getting locally raised beef can also be very expensive,” Weld said. Finding vegan or vegetarian options can be difficult, especially in school. Weld said that for the most part she doesn’t have too much trouble purchasing vegan options for herself. “It’s usually pretty easy to buy vegan foods around here,” Weld said. Despite this, Weld says that it can often be hard finding vegan options at her ultimate tournaments and in school. Schwenk has also experienced trouble finding vegetarian options from the school cafeteria. 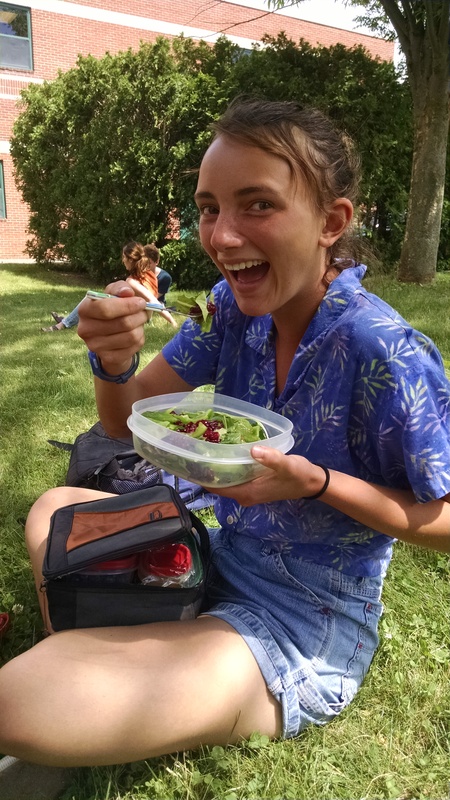 “It’s especially difficult at school because all the salads have meat in them,” said Schwenk. Overall, being part of the vegetarian lifestyle has not changed Schwenk’s family meals. She is the only vegetarian in her immediate family, which means that when the family is planning on having a dish that includes meat she has to make her own separate meal. Weld’s family was also not vegan or vegetarian until recently, when her father became vegetarian under Weld’s influence. Schwenk doesn’t feel like she gets much judgment for being vegetarian, but she said that “some people just feel bad for me.” Weld, on the other hand, feels like people have a lot of trouble understanding why she would make the decision. Both Weld and Schwenk don’t see moving away from being vegan or vegetarian any time soon. “I don’t plan on stopping being vegetarian but I may want to stop being vegan at some point,” Weld said. “Maybe on a special occasion, I’ll have meat,” Schwenk said regarding the future of her vegetarianism. To Schwenk being vegetarian or vegan represents something about the philosophies of those who choose it. “Being vegetarian or vegan is representative of values, thinking about what you are putting in your body,” said Schwenk.